Here Mark Allanson, MD at electrical wholesalers BED (Corby) Ltd (centre) part of the ANEW buying group, talks about their apprenticeship journey and gives advice for managers thinking of taking on an apprentice. 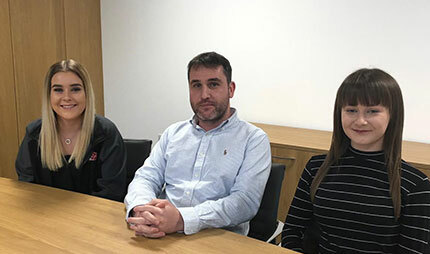 “We had hired a couple of apprentices previously which didn’t work out for a variety of reasons, but we found Charlotte Ahearn (above right) and that’s where we got lucky and it all changed. Charlotte is a great member of the team. In fact, it was through Charlotte that we found our second apprentice, the equally brilliant Ella Beesley (above left). “Times change and both Charlotte and Ella have brought a fresh new energy to our business – they are capable of so much and are very quick workers – which is fantastic,” continues Mark, “My advice to anyone taking on an apprentice is to have a plan. Managers need to be organised and prepared to spend time with the apprentice. If you drop an apprentice into a branch with no plan in place and expect them to be able to get on with it, it won’t happen. 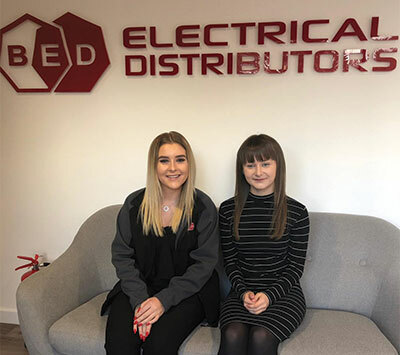 BED’s second apprentice Ella, 18, has just completed her Level 2 apprenticeship in Business and Administration through the EDA service, delivered by partners EDA Apprenticeships Plus, and now works for Mark at BED’s Head Office as a Project Coordinator. “Charlotte was a few years ahead of me at school. When I decided to leave after GCSEs to look for an apprenticeship, I changed my Facebook status and she got in touch. I came in for an interview and got the job. “When I first started at BED I was helping around the office, working on uniform ordering and helping to manage our fleet of vehicles but I wasn’t always busy, I didn’t have much responsibility and the role lacked direction. That’s when I went to work for Mark and everything changed for the better. “Mark saw my potential. Now I really enjoy my job and I feel much more involved in the running of the business. My job is varied, from helping to launch new branches to organising our corporate hospitality events. We take our customers to events such as Newmarket Races and golf days. It’s my job to pull it all together. I’m also leading BED’s charity fundraising events as well as currently organising BED’s annual overseas trip for staff which is in Ibiza this year. What advice does Ella have for others who may be thinking about an apprenticeship in the wholesale sector?